1st Gear: How Much Will The Subieyota and Toyobaru Cost? Now that we've had a chance to see the production skin of both the Subieyota ( Subaru BRZ ) and the Toyobaru ( Toyota GT 86 / Toyota 86 / Scion FR-S ), two questions remain. First, will it live up to the hype, and second, what's the price tag? Autocar reports this morning that Toyota sources tell them the all-new Toyota GT 86 coupé will cost less than £28,000 when it reaches the UK next summer. That's significantly more than the £22,000 cost originally expected for the 155mph rear-drive machine. What does that mean for the price here in the U.S.? Absolutely nothing. All we know so far is that it'll cost more than the current top-of-the-line Scion tC ($18,995) but below $30,000. And since we know that they're targeting the Genesis Coupe and the Ford Mustang — some estimates price the Scion at around $23,000 - $24,000. And since the Subaru BRZ is supposed to be the more performance-oriented model, everyone claims it'll likely cost a bit more than its Toyota/Scion kissing cousin. The JDM-only Subaru Impreza WRX STI S206, unveiled today ahead of tomorrow's Tokyo Motor Show, may look, at first glance, like a normal STI sedan, it's not. For starters, the S206 bumps horsepower up from 305 to 316 hp, and torque's up from 290 to 318 lb-ft. That's thanks to a ball-bearing turbocharger and a reprogrammed ECU. Additionally, the suspension gets Bilstein dampers and STI coil springs — plus a set of BBS wheels and Michelin Pilot Super Sports. They're only making 300 units of the special edition super-sporty Japanese four-door, so if you're in Japan, go get 'em while they're hot. Bloomberg reports that Aston Martin, the formerly British luxury sports-car maker, plans to increase the number of dealers in China as it aims to double sales next year in the brand's fastest growing market in the world. Of course, because it's Aston Martin, an increase in the number of dealers means they're adding four dealerships and a "doubling" of sales means they'd like to sell 500 cars. Aren't luxury automakers adorable? Nissan's unveiled a new, conceptual Nismo-ized look for the Nissan Juke one day ahead of the Tokyo Motor Show. The concept's an idea of how a premium sports version of the compact crossover could look. At this point we're unsure whether this is just a distinctively-styled version of the Juke, or if, like the Juke R concept we broke the news on a few months back, there's actually some meat behind the parsley-adorned potatoes. So many groups are lining up for exemptions from the new measure set by the Federal Motor Carrier Safety Administration restricting truckers to driving only 10 hours per day, that it may just have to be gutted, said Henry Jasny, vice president of Advocates for Highway and Auto Safety, which favors the regulation. "If you accept the rationale for these industries, why would you have any logical reason to deny every other single industry?" said Jasny, who is also general counsel for the Washington-based coalition of consumer groups and insurers, to Bloomberg. "The exceptions devour the rule." The 10-hour regulation, proposed by President Barack Obama's administration last December, and a drop from the Bush administration's previous drop to 11 hours, would cost the industry $1 billion, the Transportation Department estimates. That makes it one of the seven most expensive regulations under consideration, according to the White House. 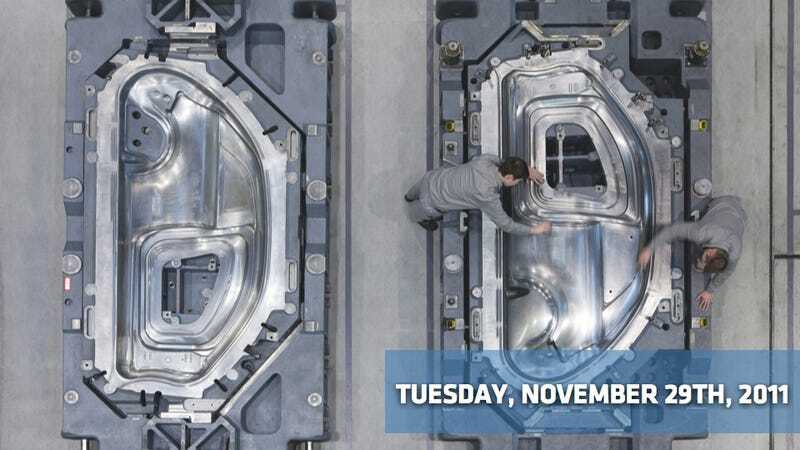 That there is GM Experimental Assembler John Ross (left) and GM Experimental Assembly Team Leader Chuck DeKubber beginning to build the 100-millionth GM small-block engine — 56 years after the first production small-block early this morning at the GM Performance Build Center in Wixom, Michigan. The milestone hundred-millionth engine is a 638-horsepower supercharged LS9 small block — the most powerful engine ever built for a GM regular series production car — normally found under the poly-carbon hood of a Corvette ZR1. But this one won't be going under the hood of a ZR1. Nope, instead, GM will drop the engine into its historical collection. What a waste.